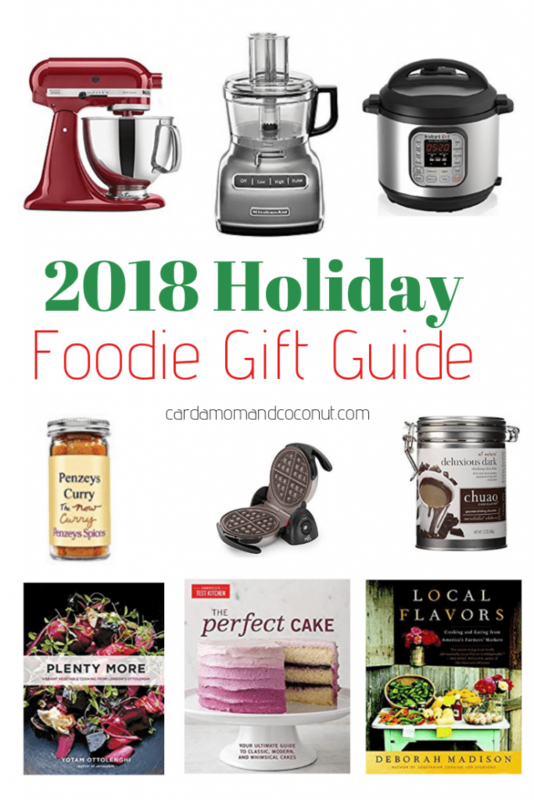 Find a gift for any chef or foodie in your life with this holiday gift guide! It feels too early to start thinking about Christmas gifts… but with Thanksgiving past us in the US I’ve been seeing sales and Christmas decorations everywhere. Whether you’re someone who shops ahead (like my mom) or someone who likes to buy gifts the day before the holiday, hopefully this collection of gift ideas will give you some inspiration for the cooks on your list (or maybe for yourself, I won’t tell anyone). Everything I’ve included is either one of my favorite items in my kitchen or cookbook collection or is something that I have on my own wish list. This post contains affiliate links. When you buy through these links, it helps me to continue creating recipes. See my disclosure policy. Instant Pots are everywhere this year. This is the perfect gift for someone who doesn’t love cooking but wants to cook more at home. An Instant Pot is also great for someone like me who loves to cook but is busy and sometimes wants easy hands-off meals. For recipe inspiration check out my collection of Instant Pot recipes. The Instant Pot that I have is the Instant Pot 6qt Duo. You’ll often see big sales on the Lux model, but this one doesn’t have a yogurt button in addition to some other features that are awesome with the Duo. If you’re buying this for a larger family, get the Instant Pot 8qt Duo. I got my Kitchenaid stand mixer as a wedding present and it’s still amazing and going strong. This is perfect for the baker in your life. Pretty much every dessert I make uses this mixer, from cheesecakes to salted caramel chocolate chip cookie bars to carrot cake with whipped cream cheese frosting. An immersion blender is something I never knew I needed until I had it. It’s great for making things creamy without having to pour hot liquids into a regular blender. I use it most for creamy soups and gravy but have also used it to whip heavy whipping cream when I wanted some for hot chocolate without taking out my beloved stand mixer. Food processors make quick work of recipe prep. I use mine most frequently for dough and batter, like this mushroom galette dough or a walnut-based cake. It’s also great for quickly chopping up fruit, veggies and other tough ingredients. I bought this particular KitchenAid food processor a few years ago when I was hosting Christmas at my house and it saved so much time in my meal prep. I’m generally against kitchen tools that only do one thing. I make an exception for my waffle maker. My husband bought me this waffle maker a few years ago for a birthday present and I still use it all the time. While I sometimes make fancy waffles, I actually most frequently use this Kodiak Cakes pancake mix – loaded with protein and super easy to make – just add water! Anyone that’s been following my blog has seen my posts for The Cake Slice Bakers. In 2018 I’ve been doing monthly bakes with the group from The Perfect Cake cookbook. For examples of some of the cakes, check out my recipe reviews here. Every cake I’ve tried, even complicated, multi-layer cakes turned out perfectly and the recipes were so easy to follow. Yotam Ottolenghi is an Israeli-British chef and makes colorful, unique and flavorful vegetable-forward dishes. I was gifted Plenty More a few years ago from a close friend and have his other cookbooks on my wishlist as well, including Plenty, Jerusalem, and his latest cookbook, Ottolenghi Simple. I fell in love with Vietnamese food because of a tiny restaurant I found in Nanjing, China. When we returned to America, my husband gave me this Into the Vietnamese Kitchen cookbook by Andrea Nguyen for our first Christmas after we moved to Nashville from China and I’ve been relying on it ever since. Tasting Italy is a new cookbook from America’s Test Kitchen in partnership with National Geographic and is one on my wish list. I’ve used many cookbooks from America’s Test Kitchen in the past, and they’re all wonderful. What makes this one unique is the maps and color photographs taking you on a journey through the history of Italian cuisine by region. You’ll learn about cheese, wine, olive oil, and pasta with foolproof tested recipes. The Betty Crocker cookbook doesn’t sound very exciting, but it will be so useful for a newer home cook. I bought a copy of this book before I moved to China and the well-worn pages made the cut of books that I shipped back. Twelve years later and I still rely on it. My sister gave me Local Flavors by Deborah Madison shortly after I moved to Nashville. I love the focus on fresh, seasonal ingredients. The recipes are even organized by season, so you know exactly which section to turn to for inspiration. Deborah Madison has a newer cookbook out as well, In My Kitchen: A Collection of New and Favorite Vegetarian Recipes that looks just as good as Local Flavors. Good quality sea salt really amps up the flavor of any dish. My husband brought back some Jacobsen sea salt from a trip to Oregon and I was hooked. I love to use it in these salted caramel chocolate chip cookie bars, but also sprinkle it on veggies to make weeknight dinners a bit more special. They also sell gift sets of flavored salts that look incredible. Penzeys makes excellent, flavorful spices. They’re also headquartered in Wauwatosa, WI, close to where I grew up. I especially love the curry, bold taco seasoning, and cinnamon. They also sell great gift sets. Standing Stone Farms is a dairy goat farm located right outside of Nashville. I’ve had my eye on their cheese making workshops for years. If you can’t make it to the farm, check out their cheese making kits you can buy online. I’ve been making Instant Pot Greek yogurt every week for months now, it’s by far my favorite breakfast. I used to strain the yogurt using a cheesecloth and a colander, which worked well but was a pain to clean up. Then I bought this Greek yogurt strainer and now Greek yogurt is even simpler! It’s totally worth the money. I love the chuao brand of chocolates, so their drinking chocolate sounds like a divine treat on a cold winter day! Another gift idea for the foodie or chef in your life is a cooking class so they can learn new skills and dishes. I’ve been gifted many classes over the years from Sur la Table, Whole Foods, and other local cooking stores. They ranged in topic from knife skills to Indian cooking and choux pastry and were some of my favorite gifts! Some good ideas there. Have you found a way to use whey? It looks like the strainer has a collection bowl under it. You can use it in place of buttermilk in baked goods – I’ve used it in blueberry muffins and heard that it’s good in pizza dough and bread as well. I’ve also heard of people using the whey in their smoothies.